Before I moved to Utah to study Aesthetics (I’m originally from Southern California) I could skip a daily moisturizing every once and a while and the humidity would make up for it. Nowadays, my skin has to have lotion applied daily, like right when I get out of the bath tub, especially on my elbows and hands. This winter has been especially cold and not the cute “oh look, it snowed an inch, let’s make hot cocoa” kind of cold, I’m talking about the dry cold that chills you from the inside out, leaving your hands looking dry and 10 years older than you actually are (insert “freaked out” emoji here). Because my beauty routine changes during the dry winter months, using Jergens® Wet Skin™ Moisturizer (which absorbs two times faster than normal lotion) has made all the difference. It can go directly onto my wet skin after I wash my hands or come out of the shower, instantly locking in moisture for 24 hours with no need to rinse it off, just pat dry. Which is also why this lotion is getting added to my pool bag this summer. As a Master Aesthetician, I worked for nearly 4 years at a high-end day spa and absolutely loved helping my clients feel relaxed and beautiful. I thought it would be fun to share a few beauty tips with my friends during a night of facials, hand massages and relaxation so I planned a spa night party. We also made our own all-natural lip balm, so watch for that recipe/tutorial at the bottom of the post. When it comes to relaxation, ambiance is everything! I made sure to have instrumental music playing, candles lit and a beautiful spread of succulents, earthy stumps and some smooth rocks out to set the mood as my guests arrived. Guests were able to enjoy some fresh fruits and veggies while we waited for everyone to arrive. Once everyone was there, we stared our main activity of fruit facials with hand and arm massages. For the menu, I wanted to keep things light, fresh and simple. I served an array of fresh fruits and veggies and even had mixed field greens for guests to build their own salads. Make sure to serve sliced cucumbers because they also make for great eye pads during the Greek yogurt face mask. Fruit infused water is the perfect beverage to serve for a spa night. I served two different flavors, strawberries-lemon and cucumber, green apple and lime. Both were tart yet refreshing, and could be refreshed by adding more water. The best ending for any party is to have your guest leave and say to you, “lets do this again”. I wanted to send my guests with a little something to remind them of our spa night, and give them something relaxing to do at home too. As party favors, I sent my guests home with gel eye masks and miniature nail kits. For our last activity we made all natural lip balm. Which is actually very easy to do if you’ve thought about it and haven’t tried it yet. We kept things pretty simple, but you could customize these anyway you want by adding different essential oils, colors or tints. Place the mason jar inside the sauce pan and fill the outside half way up with water. Make sure not to get any water inside of the mason jar or your lip balm won’t turn out. On medium heat, add all of the ingredients into the mason jar. Using a wooden stick (or bottom of a spatula), mix until all of the ingredients have melted together completely. Prepare the lip balm containers by lining them up and removing the lids. The jar will be VERY hot, make sure to use a thick kitchen towel to pour the melted contents into a plastic squeeze bottle. Still using a kitchen towel over the hot squeeze bottle, quickly fill all of your lip balm containers. Allow 5-10 minutes for them to cool and enjoy! I had so much fun planning this spa night and I loved sharing my beauty tips with all of you. 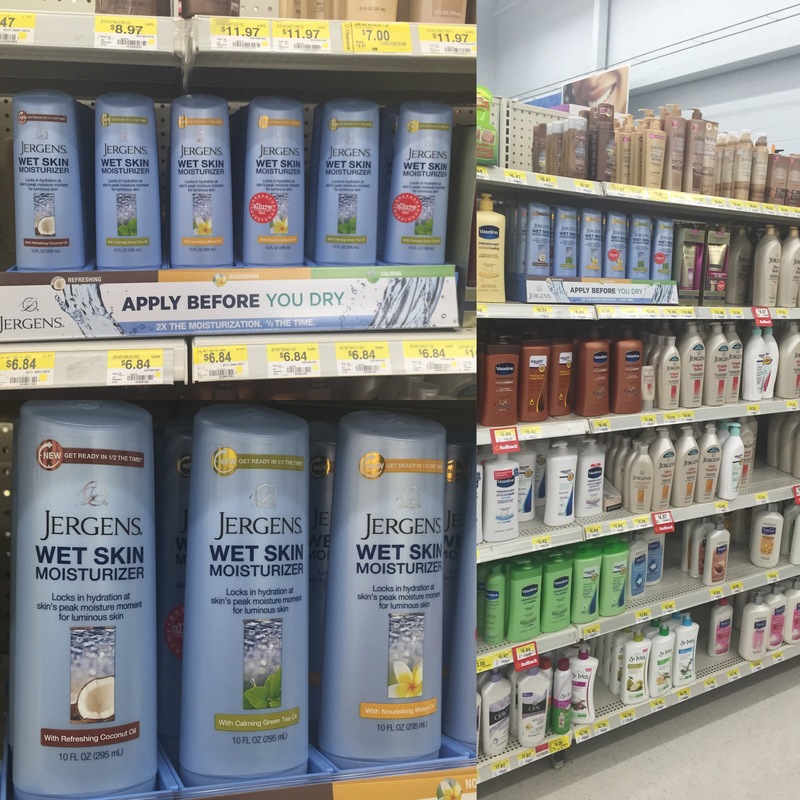 Make sure you check out the lotion isle at your nearest Walmart to stock on Jergens® Wet Skin™ Moisturizer for your next spa night (with or without friends). You’re going to want a bottle in your bathroom to get your skin through this winter, trust me! You can also see whats new from Jergens by following them on Facebook. 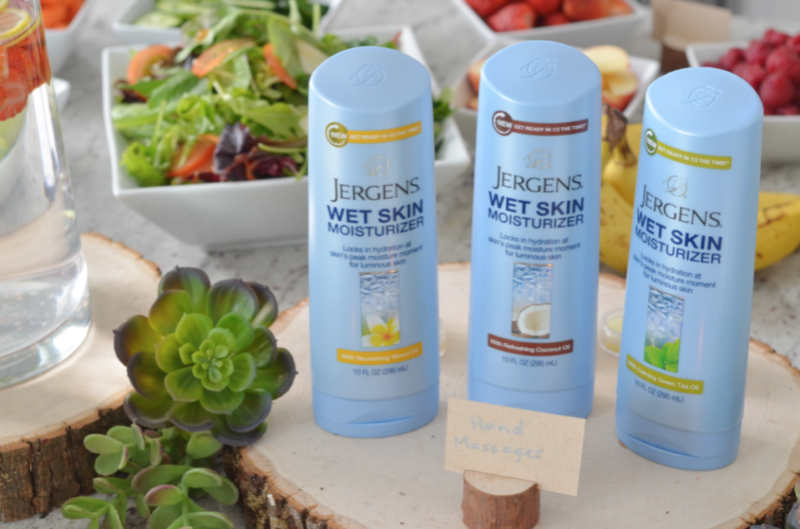 What Jergens® Wet Skin™ Moisturizer aroma do you like best? Great idea and information. Thank you very much for sharing.